For weeks, Trump and his subordinates have repeatedly hinted at pre-emptive military action and suggested that America would act alone if necessary to deal with North Korea. During his recent visit to Seoul, Vice President Pence said the Obama administration’s policy of strategic patience is over, linking the recent strike on Syria and dropping the world’s largest conventional bomb on Afghanistan as signs of American resolve. He warned North Korea not to test Trump, but emphasized administration resolve to more vigorously enforce US laws by no longer holding back on imposing sanctions on North Korean and Chinese violators. He emphasized the door to diplomacy remained open. Trump’s national security adviser, Army Lt. Gen. H.R. McMaster rightly stressed that America would exhaust all sanctions and diplomatic means before resorting to force. But just this week, Nikki Haley, the US ambassador to the United Nations, said that another North Korean missile test could trigger a military response. North Korea has been a thorn in the side of every American president since Harry Truman, but the difference now is that Pyongyang is working to miniaturize a nuclear device and mate it to a long-range rocket, making it a growing threat to the United States and its allies. And given North Korea’s track record of movie villain-style unconventional thinking, a nuclear weapon could arrive on target in a vast range of other ways, like a cargo container or a small boat. The scale of the threat demands collective international action. But threatening the use of force is unlikely to work against a deeply paranoid and brutal regime that has methodically built nuclear and conventional capabilities – combined with aggressive leadership with a penchant for outrageous and destabilizing provocations – to make itself a very difficult problem. Pyongyang has enormous leverage and knows it. It’s irresponsible to talk about preemptive surgical strikes or military action on or against North Korea given any action could ignite a full-scale conflagration on the Korean peninsula and beyond. Pointing to American action in Syria and Afghanistan – where Washington could act with impunity – as evidence of US muscularity toward North Korea is simply not credible. Indeed, threats could backfire badly, escalating an already tense situation with a country that developed nuclear weapons specifically because of its fear of a US-led attack. The only military action that may be possible is to shoot down future North Korean missile tests once they cross into international airspace. If Pyongyang is going to flex its muscle and learn from each test, America and its allies can practice how best to shoot down those missiles. The question then is how North Korea would respond. Any miscalculation or clash of overly macho egos could result in a nuclear exchange at worst or a devastating conventional war that would put 20 million South Koreans instantly in the cross hairs of some 10,000 artillery pieces and rockets. 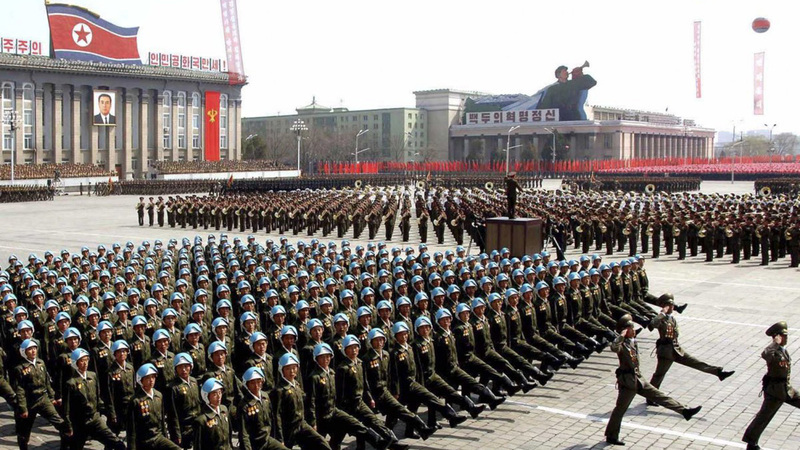 The good news is, the North Korea regime needs the constant threat of war to survive, knowing that either war or peace will lead to its destruction. And as a desperately poor nation that depends on itself to feed its people, it can’t afford a conflict now in what is prime planting season where the entire nation bends to the task of agricultural production. That’s not to say, however, that things can’t go very wrong, very quickly. Kim Jong Un is vastly more reckless than either his father and grandfather, who played their hand with far greater nuance. Having executed his own uncle with an antiaircraft gun, Kim’s purges are growing larger and more frequent, suggesting his grip on power may be tenuous. He is exactly the wrong guy to back into a corner with no way out. Also worth remembering that in his system, any sign of weakness – particularly bowing to American threats – is more likely than not to trigger another provocation to force Washington’s hand. That, in turn, means America may be the one forced either to climb down or make good on its threats, regardless of the consequences. Trump has been critical of his predecessor’s approach to North Korea, and with good reason. The Obama administration claimed to be tough on North Korea, but consistently declined to more vigorously sanction both North Korean and Chinese entities despite concrete evidence of repeated violations. Underplaying the threat to the United States, they also waffled on national missile defenses. That said, the Obama administration worked to improve regional security, deployed the Theater High Altitude Area Defense System to Korea and invested in upgrading existing Patriot missile defenses, increased training and planning, and launched highly classified operations including cyber and other efforts to slow the country’s nuclear and missile progress. Trump continues to strengthen relations with allies, deploy new capabilities, improve training and planning, and use classified means to stymie the North. Stopping North Korea’s programs, however, means Washington must build a strategy to convince, or compel, the international community to action. Trump was right to meet with key ambassadors to the UN to explain America’s concern and why action was needed. The U.S. can also take significant actions on its own against North Korean and foreign entities, particularly Chinese, that facilitate Pyongyang’s prohibited programs. In its zeal to be muscular and differentiate itself from its predecessor, the Trump administration has undermined its own credibility. The threat of military force can help advance diplomatic efforts, but are effective only when they are taken seriously. If the US president tells the world an armada is heading to the Koreas, it had better be an armada and it had better be heading toward the crisis rather than, for weeks, sailing away from it. What presidents say matters, and incessant contradictions or changes of direction aren’t signs of strength, but rather worry allies and could prompt adversaries to miscalculate. America is most successful when it – and its leader – is both credible and popular. Second, membership in the nuclear club means living by clear rules. Washington must make it clear to Pyongyang and Beijing in public and private that any use of nuclear weapons against the United States or any of its allies will result in certain nuclear retaliation. Whether it has 5 or 50 nuclear bombs, America is a first-rank nuclear power that can, literally, annihilate North Korea. Third, China is key to addressing the crisis as its the source of 90 percent of North Korea’s trade. Trump has rightly been ratcheting up the heat on Beijing to play a bigger role in reigning in Pyongyang. Washington has considerable economic and political leverage over China, which recognizes North Korea is steadily becoming a liability and that its economy depends on good relations with the United States. For decades, Beijing hasn’t wanted to resolve the crisis for a range of reasons. The last thing China wants on its border is a united Korea – that could be home to thousands of US troops. An erratic Pyongyang also forces Seoul, Tokyo and Washington to expend considerable mental and financial resources on a challenging problem. During their recent meeting, Trump struck a deal with Xi Jinping, reversing course on labeling Beijing a currency manipulator and putting on hold enforcing U.S. laws against Chinese entities misusing the U.S. financial system. In turn, Trump perceives he received China’s commitment to reign in North Korea. But Beijing has repeatedly failed to deliver on previous promises. This time, China publicly declared it was turning back ships carrying coal from North Korea. The question is why those ships were enroute given Beijing had said it would stop North Korean coal imports this year. Washington’s pressure, however, must be thoughtfully applied in a year when Xi is vying for another term at the 19th Party Congress later this year. Still, Chinese entities can’t be allowed to violate US law and UN resolutions with impunity by laundering money through American financial institutions. US officials, in turn, must recognize that the relationship between China and North Korea in many ways mirrors that of the Soviet Union and East Germany during the Cold War. Just as Berlin regularly bucked its political master Moscow, Pyongyang gives Beijing the brush – as is the case during the current crisis. Fourth, Washington’s most powerful weapon will be cleverly structured economic sanctions to make North Korea and anyone that does business with it financially radioactive. The best model was the George W. Bush administration’s masterful order that US financial firms and companies stop doing business with Macau-based Banco Delta Asia. That, in turn, impacted North Korean, Chinese, Russian and other accounts that did business with Pyongyang, leading to denuclearization talks. Using secondary sanctions, Washington can wean Chinese banks and businesses away from economic engagement with North Korea, irrespective whether that’s what leaders in Beijing want. Even the Bank of China defied the Chinese government by cutting its ties to Pyongyang out of fear that it would be subject to US sanctions. America is the world’s largest economic market and the vast majority of all international financial transactions, including North Korea’s, are denominated in dollars, requiring them to go banks in the United States that are regulated by the US government. As such, Washington can fine, freeze and seize assets, and block institutions from accessing the US financial system. The United States imposed $12 billion in fines on European banks for laundering Iranian money, but has yet to take action against any Chinese bank. This is a critically important tool that must be increasingly used in a world where the cost of conflict may be too high. Finally, the United States must invest in better and more layered missile defenses to protect America and its allies. North Korea is a problem that has developed over decades. Strategic patience remains vital as there are no easy answers to this crisis. Progress will require patience, focus, strategy, nuance and the nation’s diplomacy, economic and military levers.